Roberts stole the gun he used to commit this attack from a friend just hours before the shooting.3 Yet despite the fact that he left a firearm unlocked and accessible to anyone in his house, Roberts’ friend did not break any federal or state laws. Oregon, like many other states, does not require guns to be locked or securely stored when not in use. Furthermore, state law does not mandate that gun owners report theft of their firearms. Since the Clackamas Town Center shooting, advocates for responsible gun ownership—including relatives of two of the victims—have called for Oregon to adopt safe storage legislation in order to help prevent against theft and other types of unauthorized access to guns.4 Furthermore, the National Rifle Association (NRA) recommends that guns be stored in a way that makes them inaccessible to unauthorized users.5 Following simple safety procedures—such as storing guns with a trigger lock on or in a secure safe—makes guns less likely to be stolen or handled by an unauthorized user, including children. Such measures protect gun owners from gun theft and help to reduce the risks of unintentional shootings—including those involving children—and youth suicides at home. There are a number of policy proposals that could be implemented in Oregon, and in states across the country, that would help reduce the number of guns that are stored unsafely and within reach of unauthorized users, particularly children and thieves. 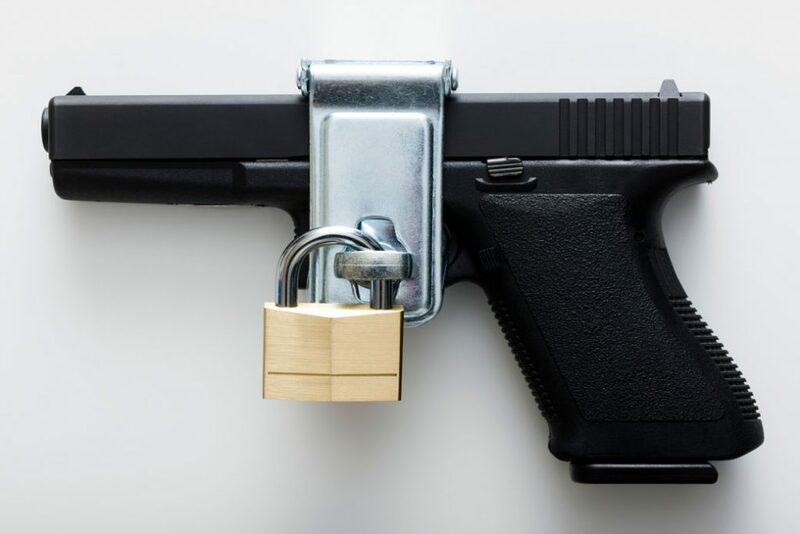 According to a review of state laws by the Giffords Law Center to Prevent Gun Violence, only Massachusetts currently requires that all guns be stored either in a locked container or with a locking device that renders the gun inoperable.30 Three other states—California, Connecticut, and New York—require that guns be locked when not in use in some circumstances.31 By failing to enact legislation requiring safe storage of firearms, states are abdicating their duty to establish expectations and norms around what constitutes responsible gun ownership, leaving many homes vulnerable to theft and unintentional shootings. It should be mandatory for gun owners to secure their firearms using trigger or cable locks or to store them in locked containers when not in use. While safe storage laws impose requirements on how gun owners store guns in the home, child access prevention laws impose liability on individuals who fail to ensure that their guns are not easily accessible by children. Unintentional shootings involving children at home are entirely preventable; they occur because common sense gun safety protocols were not followed and a gun was negligently stored.34 Child access prevention laws are designed to address this negligence on the part of gun owners. According to a review of state laws by the Giffords Law Center to Prevent Gun Violence, 27 states and Washington, D.C., have enacted some type of child access prevention law to help reduce children’s access to guns.35 These laws vary by state. Some states impose criminal liability when an adult fails to store a firearm securely, regardless of whether that failure leads to a child accessing the gun. Others impose liability only after a child accesses the gun, regardless of whether the child uses it. A third group of states impose liability only in the event of a child accessing the gun and using or firing it. Finally, a fourth group of states impose liability only for reckless storage of the firearm, rather than negligence.36 According to the RAND Corporation, there is supportive evidence that implementing child access prevention laws will reduce unintentional injuries and deaths among children, as well as youth suicide.37 At a minimum, states should enact legislation that imposes liability on adults who negligently or recklessly store firearms in a manner that could allow a child to access a gun. Additionally, anecdotal evidence suggests that child access prevention laws are unevenly enforced in states where they have been enacted. This is likely due to conflicting views among law enforcement about whether to further punish a family who has suffered a tragic loss.38 Police, prosecutors, and judges therefore need to be mindful about ensuring that child access prevention laws are implemented and enforced in an equitable manner. Securely storing firearms is a smart practice for gun owners. Safe storage laws, coupled with child access prevention laws and gun theft reporting requirements, keep lethal weapons from falling into the wrong hands, prevent tragedies that devastate families, and save lives. Chelsea Parsons is the vice president of Gun Violence Prevention at the Center for American Progress. Rukmani Bhatia is the policy analyst for Gun Violence Prevention at the Center. Jake Weigler is a consultant to State of Safety.